Mortgage Choice Financial Adviser Tim Hayman is a highly dedicated adviser with more than10 years’ experience in the financial services industry. Born and bred in the Lower Mountains, he currently lives in the Penrith area and is excited to be working within your community. I will work with you to understand your needs to meet your financial goals. Looking to build wealth, increase your Super nest egg for retirement or are you wondering if investing in an SMSF might be right for you? I have the tools, knowledge and experience to assist you in developing a personalised plan to achieve your goals sooner while making sure your lifestyle is fully protected along the way. I have a passion for keeping pace with the complex and continuously changing environment of financial advice. I really enjoy getting a good understanding of my clients - helping them put together the pieces of their unique puzzle - to make it easier for them to identify and achieve their financial goals. "Very happy thanks, Tim! Friendly, professional service. You have taken the time to explain things so that we could understand them and you understand our goals and needs very well. " "You took the time to understand and patiently prepare a plan to suit my requirements, needed over a 5 year span to retirement age of 65. I am happy with the result and peace of mind." "Tim is very proficient in his dealings and always makes time for us. He has met us at home on several occasions and has made us feel very secure on what our future holds. I would be happy to recommend him to any couple looking to secure their future and make the most out of their retirement." "We appreciated the time Tim spent explaining the process and the clear and concise information supplied." "Great Service, Thanks so much Tim!" "I must admit, I was slightly dubious with the reputation of financial planners out there. We were referred to Tim by multiple friends and I'm so glad we listened! Tim and Michelle are fantastic - professional, friendly and easy to get along with. Tim really knows his stuff. My husband has a pre-existing medical condition. Tim took the time to really listen to us, understand our needs, and he found a solution for us. He explained everything in simple language that even a tradie could understand! Michelle is one of the most efficient people we have ever met and she was with us every step of the way. She followed up with us, with our super and insurance companies, and kept us updated. It was such an easy process for us, but I know there was so much work put into it. Its reassuring to know that our family is properly protected. Thank you Tim and Michelle!" "We were introduced to Tim through our mortgage broker. Tim's knowledge, experience, understanding and expertise of where we wish to be financially and how to get there comfortably made our decision makings very easy. The rewards are paying off." 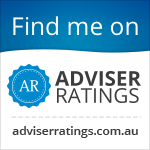 "Tim's advice is clear, precise and easy to understand, i am confident in his recommendations regarding my superannuation."